If you're thinking of starting your own podcast, you're likely to find that it involves a whole lot more work than you think. 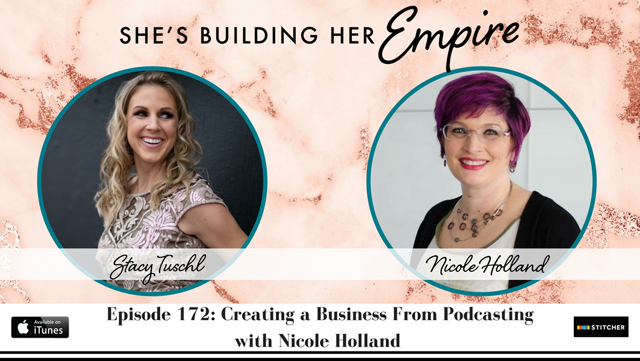 On today's show, Stacy talks to Nicole Holland, who is an expert at podcast guesting and she's also going to be one of the speakers at Stacy's She's Building Her Empire Live Event, which is coming up in two weeks. Listen in to find what Nicole does and what she has to offer. Stacy wants the ladies coming to her event to to get to know Nicole a bit better, because she wants them to take advantage of what Nicole has to share and also so that they can dive straight in on day one of the event, with any questions they may have for her. Nicole helps entrepreneurs to get featured on hot podcasts that their target audience is listening to. She helps them to understand how to position themselves so that they get both bookings and results. Listen in today and find out how to get featured on the hottest shows and get the results you want. “I've been a marketing strategist, I'm a Master Coach, …” From minute 3:34, Nicole shares some background to what she does. 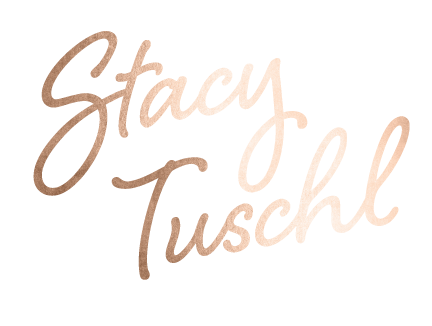 “Podcasting is such a great way to connect with people.” At minute 5:34, Stacy talks about podcasts as a way to really connect with people. “So I was not interested in podcasting- I didn't even listen to podcasts and I already had enough on my plate.” From minute 6:06, Nicole talks about how she got into podcasting. “And I'm not the kind of person who can do anything like, half- I mean I'm either all in or all out and so when I do my summits, it really is a considerable amount of time and effort and work.” From minute 8:19, Nicole talks about what goes in to creating a virtual summit. “Honestly, it was totally unintentional. I had no intention of becoming this person.” From minute 9:47, Nicole talks about what made her decide to help people to get on other people's shows. “I started really paying attention to what made a great guest, versus what made a not great guest.” From minute 12.25, Nicole talks about recognising what makes a great podcast guest. “Rather than writing a book, I did a Beta Program, called Interviews That Convert, where I taught people everything that I knew and gave them templates and stuff like that.” At minute 14.03, Nicole talks about her Beta Program. “So instead of doing the Program and having people pay for it, I decided to give it away for free, so I create a podcast called Get Guests Ready.” At minute 16:19, Nicole talks about her free Get Guests Ready Podcast. “The more we embrace who we are, what we stand for and speak our truth, the more our people come to us.” From minute 19:31, Nicole talks about attracting and working with the right people. “I'm not like a main speaker, I'm doing a break out session.” From minute 20:55, Nicole talks about what she will be covering at the Live Event. *She’s Building Her Empire may be an affiliate or receive compensation from some of the business listed for referrals, as their “thank you” for sending you their way. However, we would never recommend any product or service unless we personally love the product and have great things to say about it. Our reputation is at stake and we would not jeopardize that!